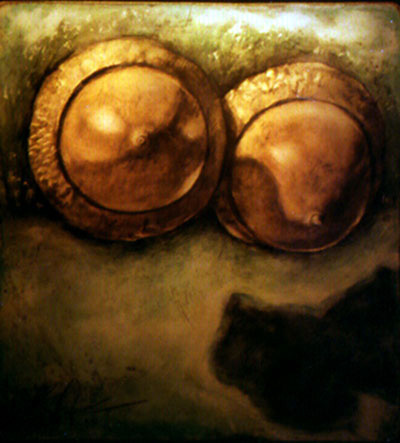 Size - 9 1/4" x 10"
Acorns have long attracted me because of their form, size and color. They are beautiful volumetric shapes with obvious sexual references to the female breast. Each is also the seed of oaks and contain that huge potential life in a small compact bundle. Using that magic as a beginning I painted them in a pair suspended in motion. The logical assumption would be that they are falling so with the freedom I get to exercise as an artist I prefered to imagine them as rising instead.